When we Americans think "Ireland" (speaking, of course, of only those Americans who think like me), we think of the large jagged Island just to the left of England. 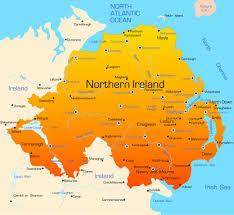 If we think a little deeper (which we sometimes do) we skip past the cursory thoughts associated with the place (the color green, the pint of Guinness, leprechauns, the Blarney stone) and realize that there are actually two entities on said island: The Republic of Ireland, and Northern Ireland. The former, a short time ago, by majority vote, repealed an amendment that protected children in the womb. In other words: the door is now open for abortion, or, as God calls it...murder. The latter, Northern Ireland, now stands alone in that region in the defense of the innocent unborn. But, predictably, this island within an island is now in the cross-hairs of the ever ravenous God-haters; otherwise known as progressives. So, as we in the United States slowly come to the realization that human life in the womb is worth protecting and are incrementally working to neutralize the poison unleashed by an overreaching judiciary; it seems on the other side of the pond there are whole majorities gleefully rushing into error and the unpleasant (though presently unseen) consequences that must result. It is my hope, and prayer, therefore, that the people of Northern Ireland stand firm against the unholy tide that is rising against them. Again, MY position is merely an extension of my sincere, Bible believing, Christian faith. AND, it truly grieves me that the land (Great Britain) that produced so many Christian champions--heroes of the Church that risked so much to spread the gospel to this continent--it grieves me that the "defender of the faith" is now slipping ever deeper into apostasy.